I love the way sport can bring out the animal in us, how folk can often be so passionate about people they might never meet, much less know. I’m looking forward to the World Tour Finals starting tomorrow, fair to say a veritable festival of tennis excellence whoever wins. Which sort of proves my point, Glinda. No lasting damage. And he would have known that at the time. But he returned to default and twisted as is his way. To have shown some perspective in the moment and put up with it for a bit longer would have been more dignified. As it was it totally killed the moment for me. But I suppose it all comes down to how you want to see your champions behave. Harsh? No. I just save my sympathy for more deserving causes. It was a tennis match, not the front line at Camp Bastion. Sorry Justin. I stand corrected. The Scots ARE brilliant at drinking. I’m assuming you don’t like Roger Federer, I love him and won’t hear of anything bad about him, otherwise I will have to punish you! Nah, still think the wimp thing stands. I concede you can’t be a wimp and win a grand slam. But over-the-top whining, grimacing and limping like a girl over your toe when you’ve just won your first major trophy and with the whole world watching gives a pretty good impression of one. He had lost two toenails in the last set. Besides, the boy wears his heart on his sleeve and that’s what I’ve always loved about him. At least he’s not a preening prat like RF. I can’t imagine anyone losing a toenail, let alone two, and not screaming the house down! That’s gotta hurt! Losing toe nails in injury terms is a flesh wound, hardly career threatening. Indeed he seemed fine parading round Central Park less than 12 hours later. 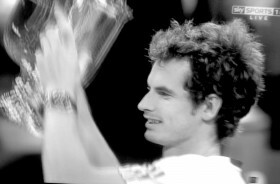 He could have just as easily held off for another 15 mins, collected his trophy, embraced the moment (if not for himself, for his family and fans, it being his first major win) then howled like a banshee in the dressing room, in private. After all, if Djokavic had taken him all the way he’d have still been playing. What would he have done? Retired hurt? Instead of which we were treat to a whiny speech about how tired he was blah, blah. It’s self depracating crap. Nor is he the tennis player with exclusivity on wearing your heart on your sleeve. He may well be open for business, just wish he’d sort his window dressing out. As for the lovely Rog being a preening prat Charlie’s said it all! That’s a bit harsh Gilly. I’m sure the poor guy had immediate medical attention and twelve hours later he naturally, or with pain killers, would have been feeling more sociable. He’s only human after all and he was hurt! Great Scot! Thought the Scots were only good at drinking. Well done Andy Murray, I knew he could do it. Well done to you too Justin for acknowledging this great achievement. I hope he can win the Australian Open in January. But don’t get carried away. We are BRILLIANT at drinking. Hey there brilliant drinker. Can you have a few drinks for me today as it is my birthday and as I am a non drinker who better to ask than you. Well actually I don’t mind one now and then but I’m saving myself until next year when I turn 40. I’ve heard life begins at 40, it had better!